Longtime readers may remember an early reference to one of our favorite military personalities, Phil Kearny. In this installment, our resident Civil War expert Ivan brings us more perspective on this fascinating adopted New Jerseyan. Take it away, Ivan! We at Hidden New Jersey revel in finding interesting historic or natural sites that are little known by today’s Garden State residents. However, in this installment, we are highlighting a true American hero; closely associated with New Jersey, who died in battle. It is perhaps the most hidden New Jersey of all when reminders of our storied past are present in plain sight but we forget the stories of those who inspired these statues and monuments. On this, the 150th anniversary of his death we choose to remember Philip Kearny. Although born in New York City, he was a member of a family whose New Jersey residents date back to at least the eighteenth century, and Phil spent much of his early years at the family homestead in Newark. the post office in the town that bears his name. As he grew to adulthood, Kearny’s father wanted Phil to study law but Phil’s interest lay in a military career. He was reputed to be an excellent horseman and the fact that his uncle was Stephen Kearny, an army officer since the War of 1812, certainly did not hurt Phil’s military ambitions. Unfortunately, his father’s objections (largely in the form of a threat to Phil’s inheritance) sidelined his military career in favor of the law. However, once Phil inherited a sum of over a million dollars upon his grandfather’s death in 1836, he finally had the independence to pursue his own chosen career track. Phil was commissioned a second lieutenant and started his career at Fort Leavenworth in 1837. He lost an arm in the Mexican War, but that did not deter now Major Phil Kearny. He managed to learn to ride a horse one-armed and stayed in the army until his irascible and stubborn personality led to enough conflicts to persuade him to resign his commission. Once the Civil War began, though, Phil belied the expression “A rich man’s war but a poor man’s fight” by volunteering his services to the Union cause. Awarded a Brigadier General’s commission and command of the New Jersey Brigade, Kearny distinguished himself as a fighter on the field but continued his penchant for fighting with his colleagues as well. Perhaps most significant was his strong criticism of his commander, George McClellan. 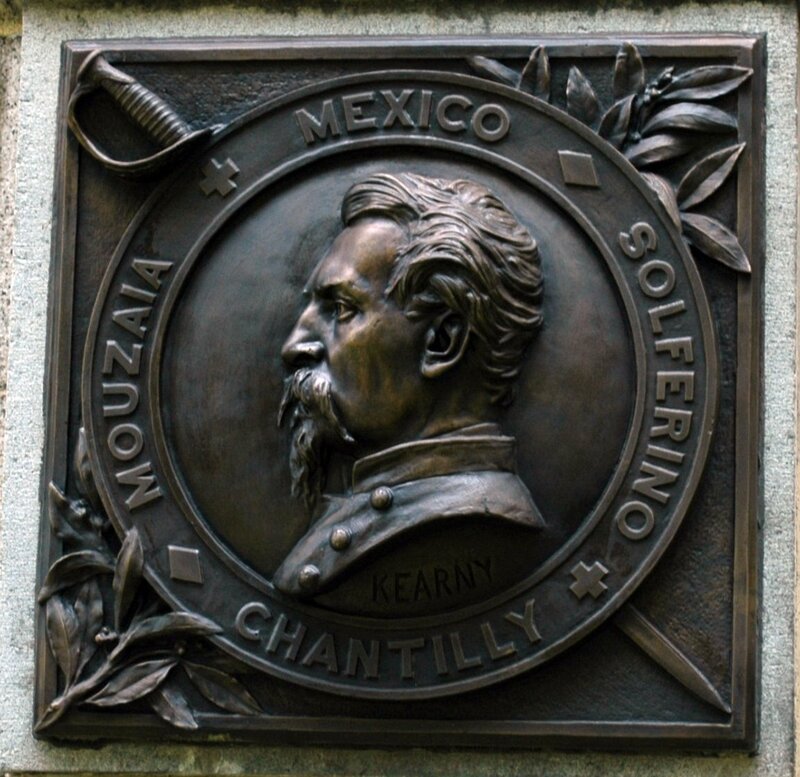 Kearny objected to McClellan’s lack of aggressive leadership during the Peninsula campaign of 1862. 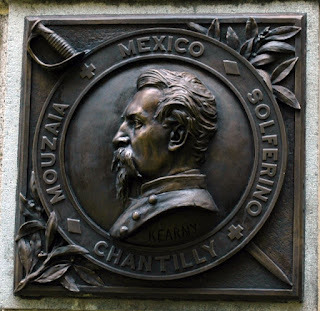 In fact, during that series of battles Phil once exhorted his men in battle by crying "I'm a one-armed Jersey son-of-a-gun, follow me!” In a driving rainstorm during the Battle of Chantilly on September 1, 1862, Kearny found himself in the Confederate lines. Although called on to surrender, he wheeled his horse around and tried to escape. He was shot dead almost immediately. Kearny was held in such high esteem that Confederate commander Robert E. Lee sent his body back to Union lines under a flag of truce. who fought under his command. Even after his death, Kearny was an inspiration to the Jerseymen who fought in the Civil War. His profile is featured on a New Jersey monument at Gettysburg, even though he died ten months before that battle was fought. He now rests at Arlington National Cemetery. Today, most New Jerseyans have not heard of Phil Kearny though his last name is familiar to many in the northern part of the state. The Hudson County community where he once lived is named in his honor, though his mansion, Belle Grove (known to locals as Kearny’s Castle), no longer stands. Statues of him adorn the grounds of the Kearny Post Office and Newark’s Military Park. If you see them, we hope you will now know and appreciate the man behind the bronze, and perhaps will give him a silent salute of respect.